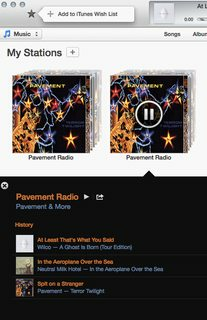 I am not seeing the options in iTunes Radio for "Play More Like This" and "Never Play This" for individual songs, nor the "Variety" slider for each station. 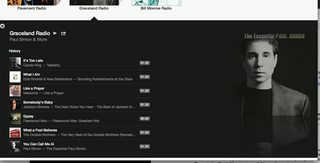 While a song is playing, click near the top-left of the iTunes window, and choose Play More Like This or Never Play This Song from the pop-up menu. Adjust the balance between new and familiar songs (on the selected station only): Click a station to display its contents, and click Hits (familiar), Variety (mixed), or Discovery (new). These features are consistently missing across all of dozens of songs on multiple stations. I can't find anything in the Preferences (or the View, Window, or contextual menus) that seems relevant, except perhaps that I have "Share details about your library" turned off. Is it related? I tried turning it on and see no change. 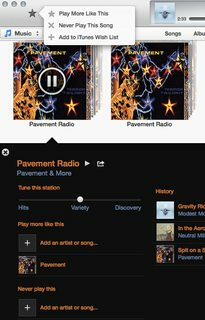 An interesting twist is that I created a station on iOS 7, using an identical starting condition - the name of a band - to one of my existing stations, which has now synced to my OS X iTunes radio, and includes these options. The stations created on OS X have not transferred to the iDevice, however. 1st Created on iOS, appeared on OS X. 2nd Created on OS X, not present on iOS. Why can't I tell iTunes that I don't ever want to hear "Margaritaville"?! There may be some DJ-curated stations that you may not be able to modify. You can't like or play more tracks like this while listening to some DJ-curated stations. You can however, start new stations based on the current track or artist of a featured station or add tracks to your iTunes Wishlist from the Star (✭) menu. As for the slider you can only use it on non-DJ-curated stations. Create a station from an artist or song then you will see the slider. Not the answer you're looking for? Browse other questions tagged itunes itunes-radio .